Enter the name of the item the address point is linked with in the Street field. Address points can be linked to different kinds of items, including: roads (e.g. Moscow, Marshal Biryuzov St., 9), squares (e.g. Moscow, Preobrazhenskaya Sq., 8), and administrative divisions (e.g. Zelenograd, Subdistrict 15, building 1510, or the Yavedino village, 45). If an address has a type like 2 Nakhimov Sq., then you should initially create a Nakhimov Sq. road infrastructure item and then link the address to it. Keep in mind that those are not the same as addresses linked to streets (e.g. Troitsk, Fabrichnaya Ploshchad St.). In these cases addresses are linked to the street. If necessary, you can link address points to other items: stations (like Zvenigorod station, 4A), or vegetation and terrain items. If there is no item to link addresses to, create one and link it with all the necessary address points. When making a new street as a linking item, make sure to also link it to the administrative division it's located in (for more information, see section 3.3.3.1.). Location. You cannot link addresses directly to a highway with proper name or a numbered highway. If an address in a locality is linked to a named or numbered highway (which in turn is linked to a higher level administrative division), then you should create another road with the same name (whose location must overlap with the road segment inside the locality), assign the locality street type to it, and link the address to that street. If an address outside a locality is linked to a numbered highway (e.g., M-1 Highway, 1), then you should create an additional “numbered highway” of the same name in the same locality and link the address to it (the road must also be linked to the locality and its shape should overlap the road section inside the locality). Enter the house number as the “Official” name. Only use characters from the language you are using to enter addresses. When writing addresses, use either uppercase or lowercase letters exclusively depending on the country's conventions. For example, all building names should be lowercase, but abbreviations should be uppercase (if that is the custom). For instance, in France all letters are lowercase: 8b. House numbers should not contain spaces. If a building has several address options, the official name should use the one that's used locally, including signs. The alternative naming options should be attributed the “Also known as, historical” type. 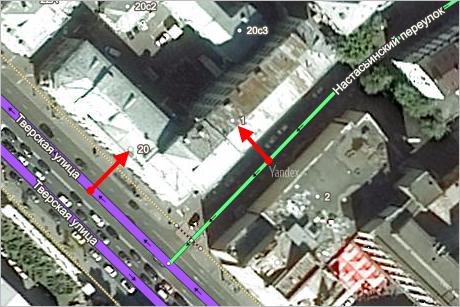 For example, if 20/1 Marshal Biryuzov St. is the official name (i.e. that is the form that is used locally), then enter the form 20к1 Marshal Biryuzov St. in the also known as field. If a building has two different addresses (if, for example, it's on a corner), then enter two address points. 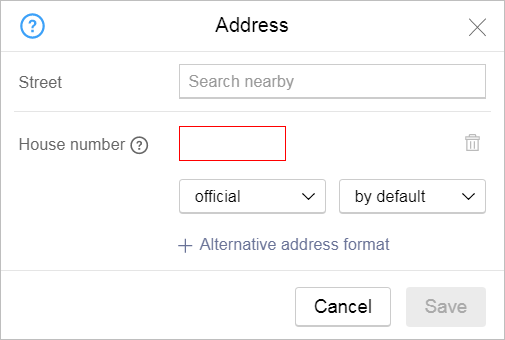 If a building has several address options, the alternative addresses must all be linked to the same address points, and have the “Also known as, historical” name type. The building is linked to two address points, each of which has two names: the official name and the synonym (i.e. the “also known as, historical” type name). If a forward slash is used in the form of the address used locally (including on signage), then the official name should include the forward slash (and the name without the sign should be entered under "also known as"). For example, official — 20/1 Tverskaya St. and the "also known as" — 20 Tverskaya St.. If the address only contains Cyrillic letters and numbers, then you can enter it for one language (Russian) and not duplicate it for another one (such as Ukrainian). You can enter temporary addresses for new buildings that do not have official addresses yet. Garage and boat co-ops are basically treated as residential buildings that share one address for the whole co-op, which is why you can attribute addresses in the co-op number—garage number format as long as this doesn't create duplicate address points. Let's say we have Garage No. 1, located in the city of Taganrog, on the Admirala Kryuysa St, 30 (see pic). That means that the garage's address can be written as 30-1 (the official name linked to the Admirala Kryuysa street).